One of the gifts I received as a solstice present was Joe McNally's book, "Hot Shoe Diaries" (thanks darling!). The book is chock full of tips and suggestions for how one might use speed lights for lighting rather than big, clunky studio lights, an idea that is especially interesting for working in remote locations where hauling a big heavy battery pack may not be ideal. There is much about working that way that I simply do not know, and the book sets my head a-buzzing. We were at my mother-in-law's house, and while my wife was involved with a project with mom that did not involve me, I read, and decided to try some things. First thing that caught my eye was a tip for holding the camera, particularly when also holding a speed light. Leaving the flash on the camera itself often makes for a terrible photo (unless you are actually trying to make the picture look like a mug shot) and moving the flash even a foot or so out of line can make a huge difference. So without having to drag along a stand, or wrangle an assistant who can be relied upon to actually stay attentive and point the light correctly, this side-firing method of bracing the camera on the off-shoulder can provide a bunch of stability. I aimed the speed light up and away for illustrative purposes. The on-camera flash optically triggers the remote light. In this shot, the on-camera flash is set to too high a power and would have been too strong for a real portrait. 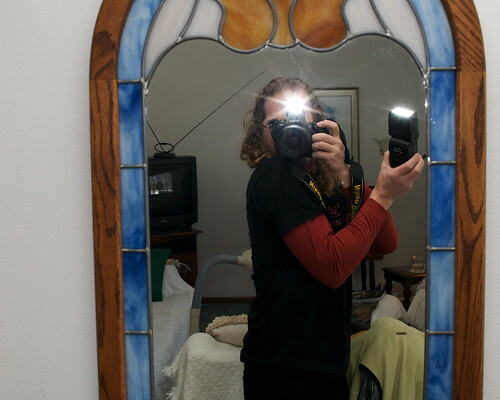 I can dial that flash down to 1/128 power and still trip the other flashes. McNally's book talks about using one, two, up to nine or a dozen speed lights to get the desired photo. I have two lights that will flash off-camera (three as of today - thanks again darling!) so I found a handy subject and took some test pictures. Not a particularly good photo, but it was what was available in the moment. One of my speed lights is hand-held left of camera and up about a foot. The other was parked on the back of a chair right of camera. Both were dialed down to minimum power. 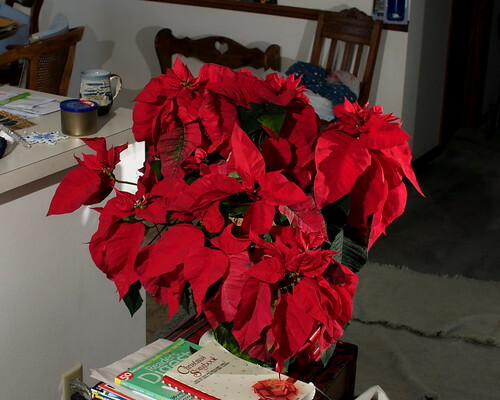 The light is pretty harsh, and there is a lot of it blowing past the poinsettia and making strong shadows in undesirable places. There are ways to tame that (diffusers, snoots, or even bouncing the light off a wall or white card rather than aiming it at the subject) but without a lot of rearranging of furniture and having to explain to my mother in law just what the heck I was doing, I just banged away and took the less-than-optimal images. They were primarily for me to experiment in the moment anyway. So now with three speed lights I can be a bit more creative. A backlight on the plant would have helped, and I could even have bounced that off the ceiling to provide some extra fill light too. I have all sorts of things to try!